I like to have a cup of tea in the evening. It’s somewhat of a family tradition that I’ve hung on to since my youth. After a long day, when you’re ready to sit down in front of the TV for awhile and relax, a warm cup of tea really hits the spot and helps you wind down. Unfortunately, I also like to have something sweet when I have my evening cup of tea. 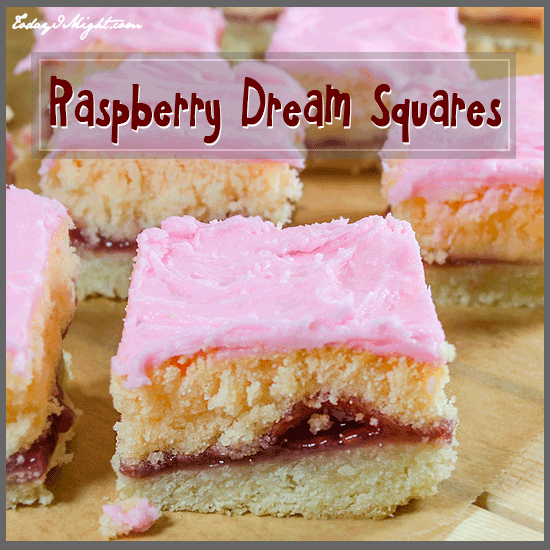 A little piece of these Raspberry Dream Squares fits the bill. 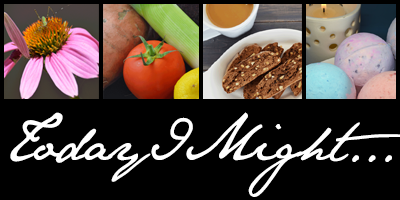 It’s scrumptious and melts in your mouth – and you don’t have to have too much to feel completely satisfied. Since I sometimes feel like I’m describing everything in a similar way here at Today I Might I asked my husband to describe them. He said “delicious”. I told him, that’s what I say about all of the recipes on this site. He said about these: “yeah, but it’s pie and cake and jam and icing…”. Mix flour, sugar salt and cold butter (cut into small pats) until crumbly by pulsing in a food processor. Add the ice water and continue to pulse until mixture forms a ball of dough. Remove pie crust to a 9" x 9" baking dish and press evenly into bottom. Cover pie dough with raspberry jam until well coated. 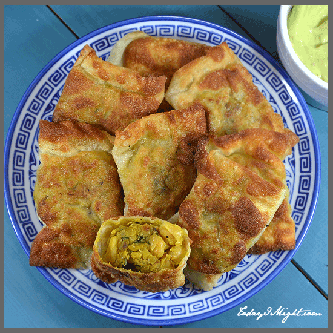 Mix in the rice flour, salt, lemon juice and raspberry extract until fully incorporated. Spoon batter evenly over raspberry jam covered pie crust. Bake 30 minutes then allow to cool completely. 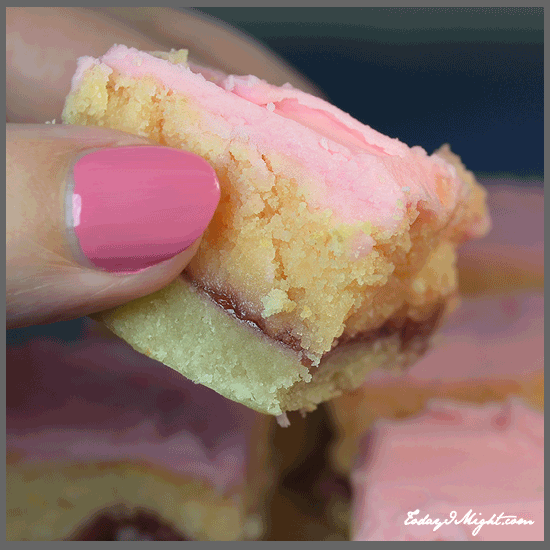 In a medium mixing bowl combine icing sugar, butter, raspberry extract and milk and mix until smooth. Mix in food coloring if adding. Ice fully-cooled cake and cut into squares. 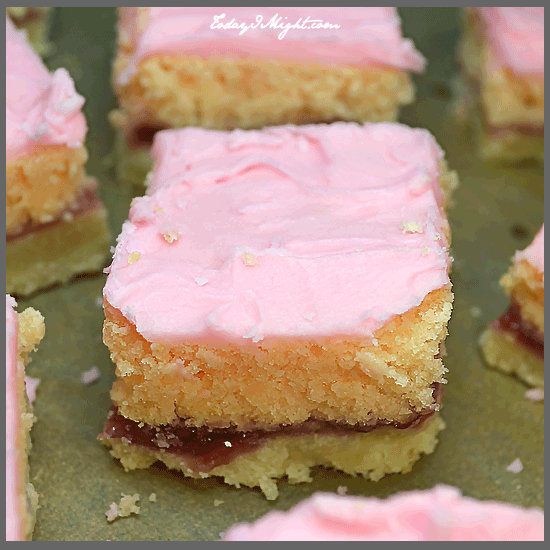 If you opt into the pink food coloring, the Raspberry Dream Squares look really pretty for a girl’s birthday or graduation party – or a baby shower if the expectant mother knows she’s having a girl. And, of course, they’re lovely for a bridal shower or Easter gathering.